About the The Global Chemicals Outlook II – From Legacies to Innovative Solutions: Implementing the 2030 Agenda for Sustainable Development: The report was developed with substantive input from a wide range of experts, and through collaboration with numerous partner organizations. EfD Senior Researchers Francisco Alpizar and Daniel Slunge were lead authors responsible for the drafting of foundational papers and specific chapters. Nairobi, 11 March 2019 – Countries will not meet the internationally agreed goal to minimize the adverse impacts of chemicals and waste by 2020, meaning that urgent action is required to reduce further damage to human health and economies, according to a UN report released today. The second Global Chemicals Outlook, presented during the UN Environment Assembly in Nairobi, finds that the current chemical production capacity of 2.3 billion tonnes, valued at US$5 trillion annually, is projected to double by 2030. Despite commitments to maximize the benefits and minimize the impacts of this industry, hazardous chemicals continue to be released to the environment in large quantities. They are ubiquitous in air, water and soil, food and humans. The world must take advantage of the many solutions that already exist and are highlighted in the report. The report finds that while international treaties and voluntary instruments have reduced the risks of some chemicals and wastes, progress has been uneven and implementation gaps remain. For example, as of 2018, more than 120 countries had not implemented the Globally Harmonized System of Classification and Labelling of Chemicals. The World Health Organization estimated the burden of disease from selected chemicals at 1.6 million lives in 2016, which is likely an underestimate. Chemical pollution also threatens a range of ecosystem services. Conversely, the benefits of action to minimize adverse impacts have been estimated in the high tens of billions of United States dollars annually. From pharmaceuticals to plant protection, chemicals play an important role in modern society and in achieving the goals of the 2030 Agenda for Sustainable Development. Driven by economic development, population dynamics and other global megatrends, the chemicals market across a range of industry sectors is growing. For example, the chemicals market in the construction sector is expected to grow by 6.2 per cent annually, between 2018 and 2023. Meanwhile, chemical production and consumption is shifting to emerging economies, in particular China. The Asia-Pacific region is projected to account for more than two-thirds of global sales by 2030. Cross-border e-commerce is growing at 25 per cent annually. Pesticides have been found to negatively impact pollinators, excess use of phosphorous and nitrogen in agriculture continues to contribute to ocean dead zone and chemicals used in sunscreens put pressure on coral reef ecosystems. Studies also indicate that releases of some antimicrobials, heavy metals and disinfectants contribute to antimicrobial resistance. Solutions exist, however. Global Chemicals Outlook II finds that governments are taking regulatory action on many chemicals. Frontrunner companies are advancing standards beyond compliance and sustainable supply chain management. Consumers are driving demand for safer products and production. Industry and entrepreneurs are developing green and sustainable chemistry innovations. Scientists are filling data gaps. Universities are reforming the way chemistry is taught. Management approaches – from chemical hazard assessment to risk management and life cycle analysis – are advancing. Opportunities exist for key influencers such as investors, producers, retailers, academics and ministers to scale up these initiatives. This would not only protect human health and the environment, but also deliver economic benefits in the high tens of billions of United States dollars annually. The development of a future global platform for the sound management of chemicals and waste beyond 2020 provides a window of opportunity. As the report highlights, this framework needs to bring together all relevant sectors and stakeholders and foster collaborative, ambitious action. Given the critical role of the sound management of chemicals and waste in halting biodiversity loss, facilitating access to clean energy and achieving other Sustainable Development Goals and targets, opportunities exist to create synergies with these and other international policy agendas. 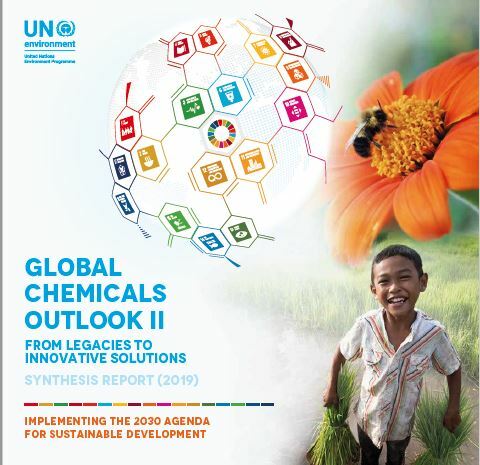 The Global Chemicals Outlook II: From Legacies to Innovative Solutions – Implementing the 2030 Agenda for Sustainable Development has been prepared by UN Environment over the past three years through a process involving more than 400 scientists and experts around the world. The Summary for Policymakers was made available as working document of the fourth session of the United Nations Environment Assembly. The Synthesis Report was launched on 11 March 2019 in Nairobi, Kenya. The full report will be released on 1 April 2019 at the third meeting of the Open-ended Working Group for the Strategic Approach to International Chemicals Management in Uruguay. The report was prepared in response to Governing Council decision 27/12, adopted in 2013, and United Nations Environment Assembly resolution 2/7, adopted in 2016.